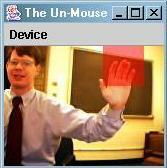 The Un-Mouse enables a user to control the cursor without touching any equipment, interfacing instead via a video camera (like a webcam) attached to a computer. The program tracks a user's moving hand, and moves it. Java 1.3 or later, plus the Java Media Framework libraries from Sun. An installed webcam or other video device. No guarantees on what will work here. The program was developed using a Video Blaster Webcam Plus, from Creative Labs, but it should work on a wide variety of cameras. The research paper explains the project in detail (and I'll post it real soon now), but it basically works in four steps. The program maintains a 20x20 ``search box,'' in which it assumes the hand is present. It displays the video picture to the user, with the search box displayed. Thus, if the hand exits the search box, the user will know where to ``grab'' it again. Each video frame, the program looks for motion by subtracting the color values in the search box from the previous frame. It does some localized averaging to reduce noise. The program finds the center of motion by averaging the x- and y-coordinates of the pixels displaying motion. In averaging, it weights the top half of the search box more heavily in order to emphasize the fingers over the arm. The program centers the search box on this center of motion. To place the mouse cursor on the screen, it uses a moving average of the search box location over time. 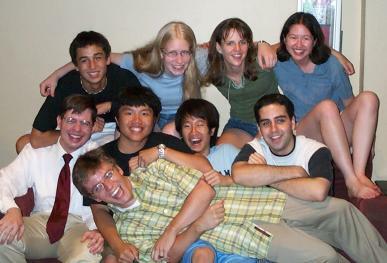 The Un-Mouse originated as a team research project at the 2002 Pennsylvania Governor's School for the Sciences, an intensive summer science program for talented high school seniors. Supervised by Carl Burch, and led by P Matt Jennings and Keith Mathers, the six students developed the algorithms used by the Un-Mouse and produced the initial program. Carl Burch polished the program up and produced this Web page for release of the software.